We are delighted to confirm that our buskers have successfully helped Musequality to achieve a new Guinness World Record title for ‘Largest Busk at Multiple Venues’! The final record approved was an amazing 871 participants at 21 venues across the world, which was a fantastic result considering the original target was a minimum of 10 groups each comprising at least 25 participants. We would like to congratulate each one of you for your invaluable role in this record-breaking achievement, we really could not have done it without you. To use Guinness' own wording, you are OFFICIALLY AMAZING! 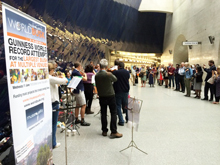 On 11 June 2014 over 1000 buskers performing in choirs, orchestras and bands from London to Mumbai attempted to set a new Guinness World Record for the Largest Simultaneous Busk at Multiple Venues. To set the new world record, ten groups with a minimum of 25 buskers had to perform in unison at different venues. Musequality succeeded in getting 32 groups together across seven countries. Guinness World Records are now examining our photographic evidence and statements to confirm that we have indeed achieved the new record. The world record challenge came midway through Musequality’s World Busk Week® on Wednesday 11 June at 18:00 (BST + 1). In London, international guitarist Craig Ogden joined the Musequality Philharmonic at Southwark tube station, while over at the Queen Elizabeth Olympic Park Transport for London’s Licensed Buskers performed Let it Be. Finalists in BBC2’s The Choir, Citigroup Choir, joined in at Canary Wharf tube station, matched by the BSI Choir at Gunnersbury on the far side of the network. Across the world, schools, children’s music groups, flash mobs, choirs and bands pitched up and pitched in for the world first. International participants included: The Clave de Si and Provisorio choirs of nearly 50 singers, performing to a packed audience in Buenos Aires; the Hugo Lambrechts Music School on the waterfront in Cape Town; the National Streets for Performing Arts, initiative on the streets of Mumbai; and the Fandanglers, a cheerful collection of 75 buskers in the small town of Albany, Texas. Musequality Philharmonic and Craig Ogden at Southwark, Citigroup Choir at Canary Wharf, BSI Choir at Gunnersbury, Latymer Upper School at Hammersmith, TFL Official Buskers Choir and Jyotsna Strings at Queen Elizabeth Olympic Park. Dulwich and Wallington Suzuki Group at Canada water. Southbank International School and Little Venice Suzuki in Notting Hill. Jigs and Reels Strings in Northolt, Lauderdale Suzuki in Highgate, Notting Hill and Ealing High School, in Ealing, 60 children from Alec Reed Academy at M&S, Ealing, Lauderdale Suzuki at Lauderdale House, Highgate. London Transport Choir at King Cross Gardens. Funky Voices in Chelmsford, Wildern Community Choir in Hedge End. Matt Hollins and PeopleOfBristol, Naked Voices and Friends in Bristol. North Birmingham Suzuki in Birmingham. Beau Soleil Music Centre, Rondebosch, Masai Reach, Green Point, Kingswood College Concert Band, Grahamstown, Keiskamma Music Academy, Hamburg and the Zama Montessori Centre, Benoni in South Africa. Palo Alto Chamber Orchestrain Palo Alto, MIHNUET (Music in Hospitals and Nursing Homes Using Entertainment as Therapy), in Boston, RoyJohn Wheelock and Friends, St Louis, Missouri andThe Fandanglers, Albany, Texas in the USA. Tender Talents Magnet School , Kampala in Uganda, Cumnor House School Choir from the UK in Slovenia. The Clave de Si and Provisorio choirs, Buenos Aires in Argentina, and National Street for Performing Arts, Mumbai and Child's Play Foundation, Goa in India. Tim Dowling and Police Dog Hogan, in Waterloo, Pram Chorus, in Clapham, Singing it Back in Kingston and South Kensington. Robert Juritz Jazz Group in New Cross, Ishani and Selby and Tong in Waterloo, Eva and Mora, Bronwen Stevens the West London Sinfonia Octet, London Drum Circlein South Kensington. Royal Liberty Strings played at a number of events throughout London. Musequality supports projects in Uganda, Kenya, India and Thailand. For more information on the charity, its music projects and the benefits of music, please visit www.musequality.org. Musequality supports music education projects for disadvantaged children in developing countries. The charity encourages a wide variety of music in its projects, with particular emphasis on the local musical culture and communal music-making. Musequality’s aim is not to produce professional musicians but to give marginalised children an opportunity to regain their self-respect, rebuild their confidence and develop life-skills that will lead to better futures for themselves and their communities. Musequality supports projects in Uganda, South Africa, Kenya, Ghana, India and Thailand. By joining the world busk you will help us continue funding these projects – and set up more. "Today's busking went fantastically well and we collected £333.37 in two hours from a very generous audience. Thank you to everyone involved and we hope to update you very soon about progress with young Tadeo's prosthetics." “Back here in Uganda, all went well and everyone at the busk had fun. We had 30 buskers from EYBB and 15 from the church choir totalling 45. We used our brass band instruments like; trumpets, sousaphone, drums,trombones,tubas etc. We had an audience of more than 400 people at the busk, I have organized to it tomorrow at the Mbale regional hospital." “Well, our busk was both fun and successful! We only made $41 but we had a great time, and had a very entertained and amazed audience! We had 11 harpists, one fiddler and a percussionist! Thanks for organizing such a wonderful event!!!!" “Isla and Harriet did their busk yesterday! It was a sunny day in Edinburgh, but cold and fairly windy. We tried busking in the Royal Mile, but couldn't dislodge a much louder punk rocker playing brash recorded music just 20 yards away round the corner from us. So we moved to Princes Street Gardens, where lots of people passed, some stopped to listen,and a few donated. As usual, it was children and young people who were most interested, including one girl aged about 12 who asked to try out Harriet's violin. Harriet kindly obliged, and afterwards the girl gave a big grin and said it was cool! ." "Had a great day at Kirtsenbosch ...wonderful weather and everyone loved the music. Hope you too all had a great busk."